When I picture a wolf I imagine a stunning creature standing proudly, howling at the moon – but it turns out that no wolf would ever howl at the moon, that would be a waste of time and breath. You see, howls aren’t simply pointless animal sounds; each howl has its own specific meaning and purpose. A wolf’s life is its pack and howling has a large part in the workings of a pack. Wolves travel across large areas in order to track and hunt prey and when do this the pack is often separated. The sound of a howl carries a long distance and can be used to bring a pack back together. If you were to separate a wolf from its pack it will instinctively howl and howl in attempt to reunite with its pack once more and the unique characteristic of each individual howl will allow wolves to identify one another. A variation of each sound likely indicates who is howling, and the frequency modulations, particularly the sudden changes in pitch, make the each wolf’s howls much easier to locate. The only problem with this is that it’s not only the wolf’s pack that can hear and locate the howl, but also rival packs in the area. If a wolf howls too close to the enemy wolves they will hunt down and kill that lone wolf. In northern Minnesota wolves are protected animals, so humans are not allowed to hunt these creatures. But unfortunately wolves still die, but not by human means, but by hostile wolf packs. So as a wolf grows it has to learn when and where it is safe to howl – while it will reunite it with its pack, it can also bring death. Here is an excellent video of a lonesome wolf howling to its pack. A wolf’s howl may also be used to scare away an intruder. This howl is long, low-pitched and coarse; it gives a wolf the option to frighten an intruder without the need for a face-to-face confrontation. Due to a wolf pup’s size and age it can’t let out a full howl, instead its howls are shorter and higher in pitch. 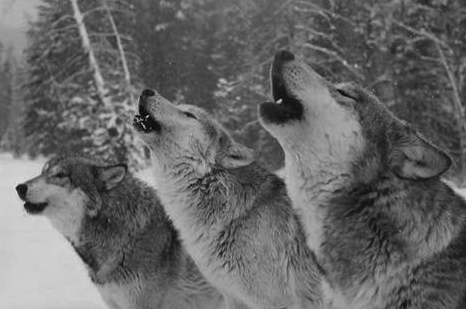 A pup howl is used in the same way as the lonesome howl; it’s a way to contact the pack. This howl is a complicated mix of multiple wolves howling together. The way it works is kind of like when a group of people sing “row row row your boat…” One starts it off, a few moments in a second joins, then a third and fourth… etc. and then number one lets out another howl and so on. This way it is one long continuous howl, and as they howl their pitch switches and becomes faster and faster. This can be used to scare off enemies, because when you hear this chorus howl you can’t tell if it’s two wolves or ten wolves. A rival pack may hear it and assume that it’s twenty wolves and therefore won’t come anywhere near, when it fact it may just be three wolves. Here is a haunting clip of a chorus howl.